I just ate a huge serving of Power Salad with Spicy Honey Vinaigrette & Grilled Salmon (or Chicken). I don’t know if it is the sway of suggestion, the nutrient-packed ingredients, or both, but I feel like an empowered lioness. Excuse me while I roar. I love eating salad named Power Salad, and only wish I could take credit for coming up with such an impressive label, but alas, I cannot. Possibly Mickey Mouse can since it was Disney World where I tasted the inspiration for this recipe. 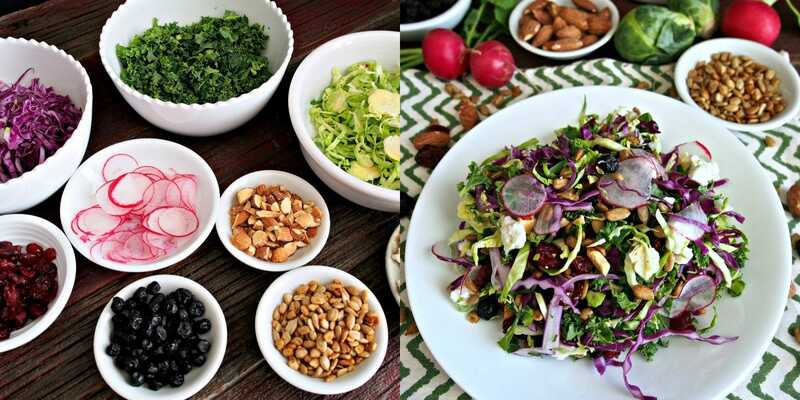 When I first read the name Power Salad on the menu, I envisioned miniature body-builders made of kale, power lifting Brussels sprout dumbbells while popping roasted almonds, sunflower seeds and dried berries into their mouths. My imagination became recipe reality when, along with the aforementioned ingredients, I included sliced radishes, radicchio, goat cheese and grilled salmon. Are synonyms of the word “power” – words like strong, robust, vigor and energy coming to mind? 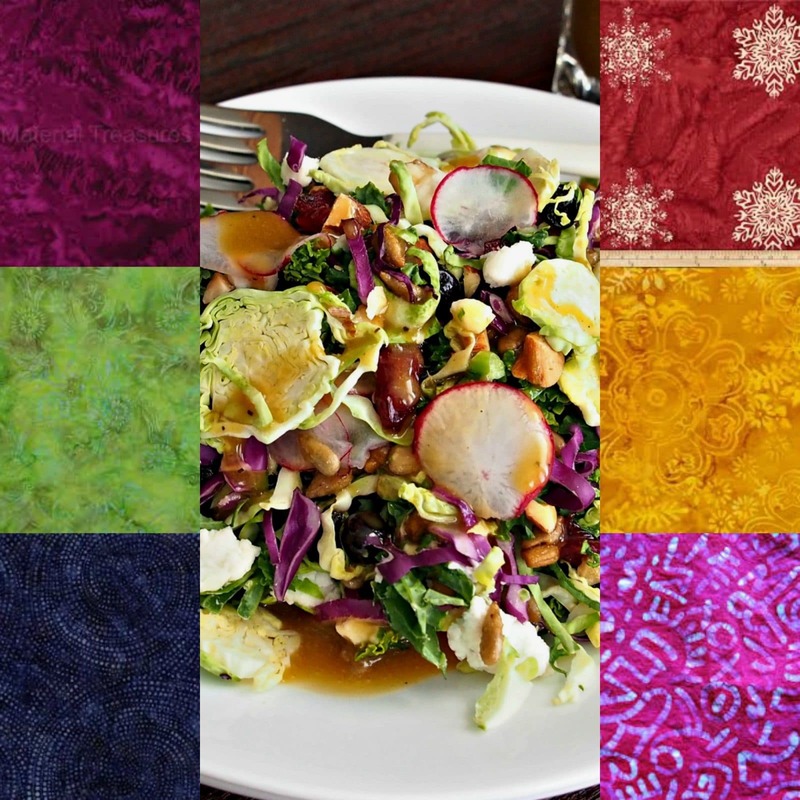 The vibrant colors of Power Salad remind me of gorgeous batik fabrics, and I knew this salad would need a dressing just as beautiful to show it off. I immediately thought of honey – like liquid gold. 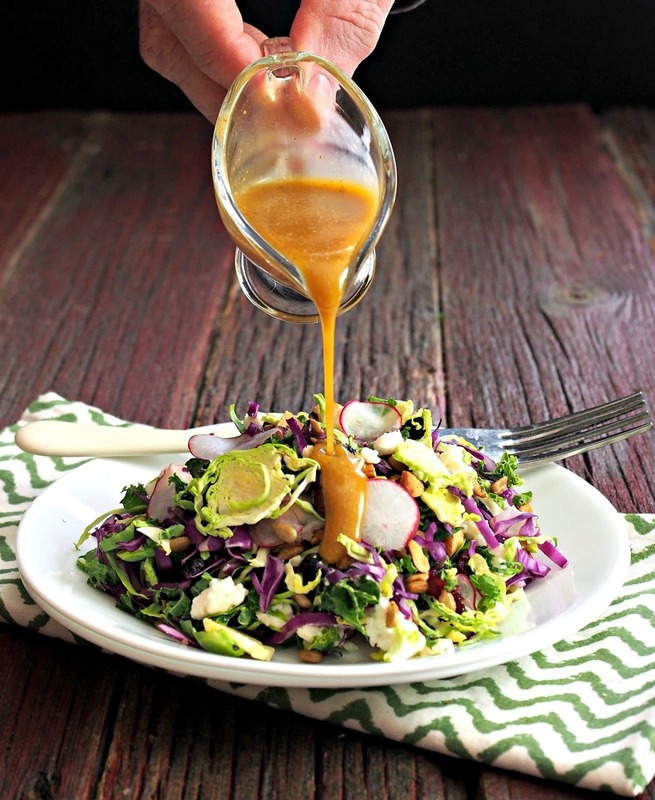 I also knew a dressing infused with a little sweetness, fragrant spices and a kiss of heat would work well and knew Spicy Honey Vinaigrette would be perfect. Spicy Honey Vinaigrette is truly one of the best things about this recipe. Power Salad loves Spicy Honey Vinaigrette and the feeling is mutual. Please don’t leave one out when making the other – they were created to enjoy life as one. The lioness in me is getting restless, so it’s time to go for now. If you hear a distant roar in the stillness of the night, you’ll know who it is. PS. If you aren’t a fan of salmon, grilled chicken works beautifully in this dish as well. Cooked quinoa chard, chicory, broccoli, other dried fruits, grilled salmon or chicken, other cheese, croutons. Use your imagination. Combine all ingredients and gently toss to combine. What a fantastic salad. 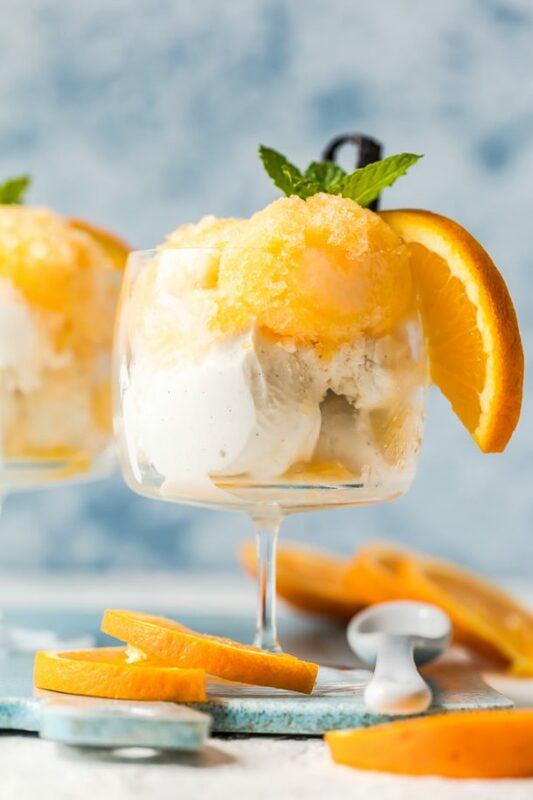 A perfect go-to for the warmer weather. We're having unseasonably warm temps right now this would be a welcome dish this weekend. Hey Janette. 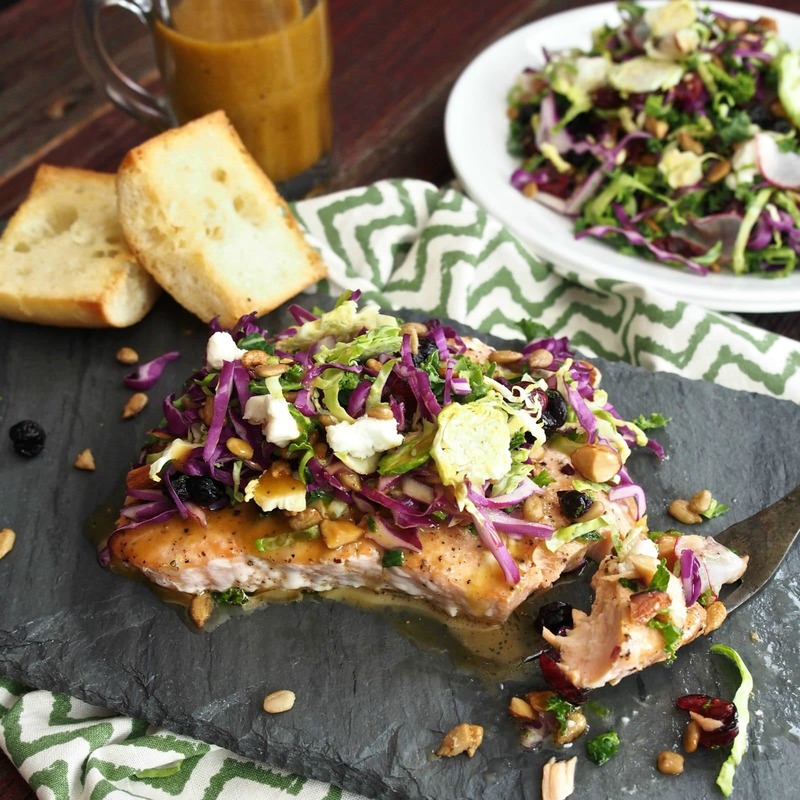 I can't express how much I love this salad - with or without the salmon. It has such vibrant flavors and is so versatile, too. Thank you for your sweet comments and thanks for stopping by. I hope you love it as much as I do. One of my favorite toppings; from one of my favorite foodies. Just beautiful and so yummy looking! ...a ton of thanks, Dan, (one of my favorite, awesome foodies)!!! What a wonderful salad, so colorful and flavorful. And I love your honey dressing. I definitely need to try your recipe, Susie! Thank you, Del. 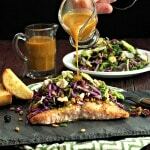 I think you will love this - the salmon goes so beautifully with all of these gorgeous flavors. 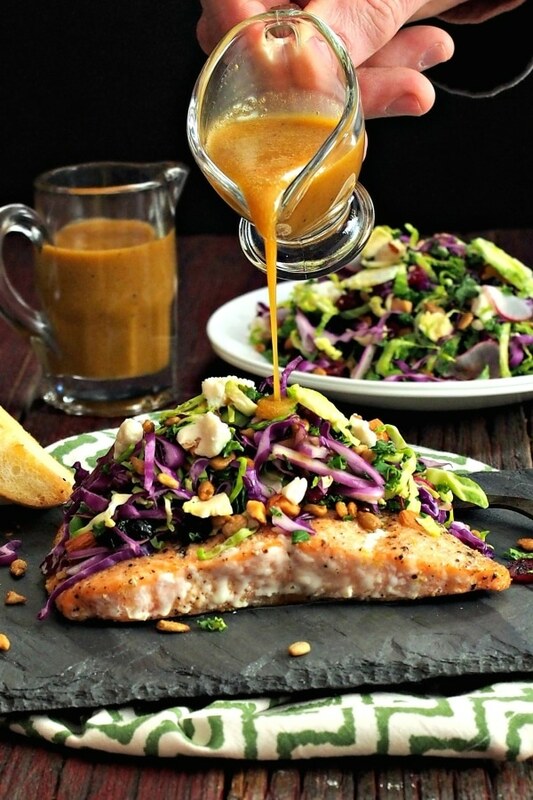 I love everything about this salad from the ingredients, to the salmon to the dressing! Thank you, Peter, and thanks so much for coming by. What a fantastic salad! So many flavors, so healthy! 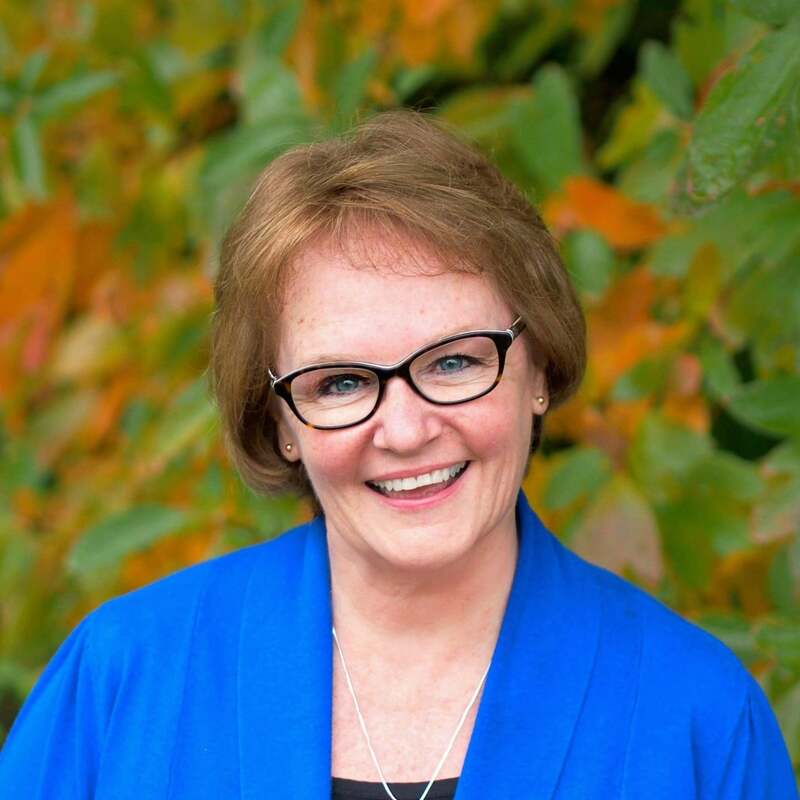 Thank you, Kecia. It's so full of flavor. I hope you like it and thanks for coming by. Thanks so much, Catherine. I agree - it is a fantastic meal and has so many great flavors and colors. Thanks for stopping by - I really appreciate it. this is absolutely gorgeous!!! The flavors, colors, textures going on here... wonderful recipe! Thanks so much, Angela, and thanks for coming by. Gotta love inspiration from the Mouse House! I bet your salad is better than the original, can't wait to give this a try! Ha-Ha, not sure the chef at Disney would agree with you, but I do thank you, Debra. Thanks so much for stopping by and for your sweet comment. 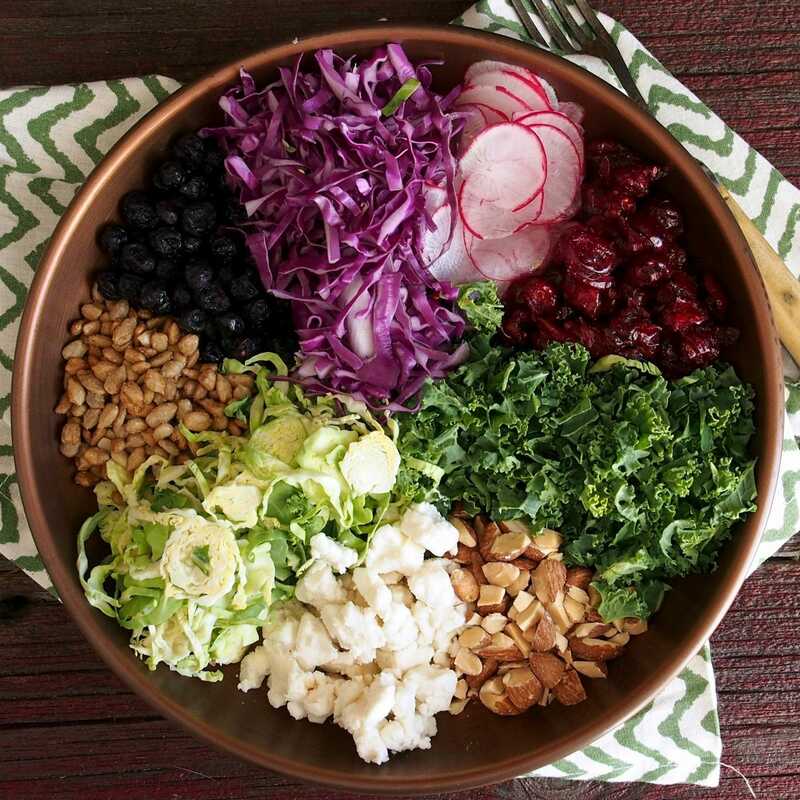 I just saw this beautiful salad on food gawker. I love your blog...the photos are gorgeous! Thank you, Thao, for your sweet comments and thanks so much for stopping by Simply Sated. Please come back soon. Thank you so much, Nic, and thanks for coming by. This is gorgeous! I love all the colors, not to mention the wonderful ingredients! Powerful, indeed! Thanks so much for your sweet comments, Patricia. This is just the kid of salad I want to dig into right now. Love the flavours. Thank you, Bintu. I would love to dig into right now, too. I guess I'll have to make it again tomorrow:-) Thanks so much for coming by and please come back soon.